Going on Napa Valley tours is always an adventure indeed, whether you are just walking or biking, riding a train or a hot air balloon. There are several tour operators whose business is providing fun and adventurous Napa Valley journeys to tourists. One of the most common ways of getting around Napa Valley is by car. Be sure to research several of the car rental businesses in the wine region and compare their prices before renting a vehicle. Depending on your preference, you may grab a few brochures or travel guide books, or hit the roads by yourself. Many tourists prefer to take a train ride to discover the beauty of the Napa Valley as well as discover several wineries. If you really want a fabulous, unique, and memorable train ride, take the Napa Valley Wine Tour, which takes you from Napa to St. Helena in about three hours. This magnificently-restored 19th century train also serves a diner area where you will enjoy exquisite cuisine. Tourists may have the option to pick their specific winery tours. Shuttle buses are perfect especially for first-time tourists or people who are traveling in large groups. There are several shuttle bus operators (such as Wine Country Shuttle Tours) which offer a fixed itinerary and designated drivers. These shuttle buses stop at several wineries in the region. Their tour packages may also include picnic lunches and a stop at the ferry, which will take visitors back to San Francisco. If you want to tour in style, limo buses offer you luxury and comfort. Several operators offer several tour options and have a fleet of different types of limos. They may set up with their own itinerary for you, or you can customize your own to adapt to your preference. Biking is also a fun way to discover the beauty of the valley, as well as discover wineries. Several biking tour operators offer packages, from one-day tours to more comprehensive vacation packages that can go on for many days. Love horseback riding? You can also do that in Napa Valley! Several travel operators also offer awesome itineraries arranged for the California Wine Country Ride. But if you’re inclined to go on a less extensive travel, you might look at horse-drawn carriage rides around the wine country, which comes complete with a gourmet picnic. Many tourists dream of riding a hot air balloon ride over the gorgeous Napa Valley during sunrise. Balloons Above the Valley (BATV) can take you on an exhilarating and awe-inspiring ride several miles above the ground. You will get to see the neat rows of grapevines, the rolling hills, and the valleys as you float above ground. Do you want to ride the hot air balloon and see the gorgeous Napa Valley landscape one summer morning? Or do you want to do it in the fall where nature boasts a variety of green and warmer colors in the fields? Or would the winter or spring be more your choice where the dormant vineyards are upstaged by bright yellow wild mustard blooms and bright green hills? Whichever season you choose, BATV will surely handle your request with expertise! BATV also includes a pre-flight breakfast and a post-flight brunch with sparkling wine. 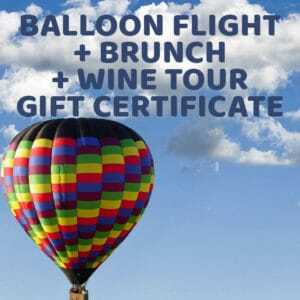 However, unlike other hot air balloon tour operators, BATV offers amazing packages that allow people to visit wineries and have tastings, to shop, to do some sightseeing, and to enjoy picnic-style lunches! BATV also offers packages for weddings/marriage proposals or prenuptial tours, as well as group and corporate tours. Whether you choose biking, train, horseback riding, limousines or hot air balloon rides, Napa Valley tours offer something different, enjoyable, and adventurous for every discerning tourist.